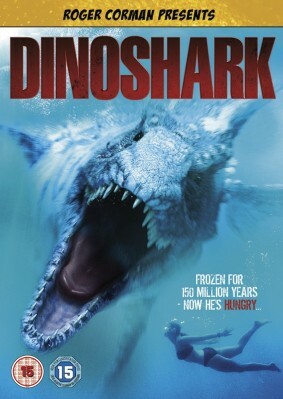 From the producers of Sharktopus (2011) comes its long lost cousin, Dinoshark (2011) – a prehistoric beast frozen in ice for around 150 million years. When global warming strikes the polar ice caps, its frozen tomb is shattered, leaving it free to roam the oceans of the 21st century. Roger Corman is back once again with another straight-to-DVD monster movie affair. Following the limited success of Sharktopus, he now brings us Dinoshark, which is almost a direct copy of the former. These movies are not supposed to be cinematic classics, but it might help if the film-makers didn’t seem so aware of this fact. The acting is poor, the direction is non-existent, the script is terrible and the general flow of the film is boring and tedious. Plus, because this is a carbon copy of Sharktopus, nothing feels original or new. It all feels like we’ve seen this all before. However, there was an element of the film that in my mind wasn’t used often enough and was something that Sharktopus never tried: they used a puppet. For the majority of the close up ‘munching’ shots, the crew used a model so they could really zoom in on the bite which heightens the effect of the shot. What’s funny though is that the puppet model looked more realistic than the CGI effects used for the rest of the film. Dinoshark may have been made on a micro budget of $2 million, but that doesn’t excuse the low-rent videogame level graphics. Out of all of the things wrong with the film, it feels bad to nitpick its low-rent special effects – but when they’re this bad, you can’t help it. Speaking of ripping things off from other films, I have to quickly mention the atrociously bad music scored by the debuting Cynthia Brown which unashamedly steals from John Williams’ genius Jaws score. It’s not just a little bit like it, it’s exactly like it which is incredibly off putting and just heightens the level of amateurish filmmaking on display. Dinoshark, much like Corman’s prior effort, could have been a good little tongue in cheek monster movie that would do quite well among B-Movie fans. However, these titles keep getting put in the hands of incompetent filmmakers who don’t know one end of a camera from another, let alone how to make an entertaining film. For all of its flaws, its biggest deterrent is that the film is just so unspeakably boring. The film is 92 minutes long and not one of them is enjoyable. Avoid at all costs.